I don’t feel I’ve written properly in this blog for a while even though it was my aim, this year, to post here once a week. I’ve sometimes resorted to using the Weekly Photo Challenge as a prompt and it’s been lovely to connect with other bloggers this way. I might never have written about my fountain pen or my Dad if it hadn’t been for the creative shove offered by someone else’s suggestion about what to write. It’s probably the same for you, but my lack of activity here means that I’m very busy elsewhere. My job with The Reader Organisation, although part-time, often takes up many more hours than I’m paid for. People tell me that this is always the way when you work for a charity. I’m proud of the four, read aloud, reading groups I’ve set up in different libraries in Wiltshire for people living with dementia, and their carers. It makes the extra hours of work seem worthwhile when I see how much people enjoy coming to the weekly groups. I’m now close to handing over some of the groups to volunteers I’ve recruited, so that I can set up in two more locations, before funding runs out next Spring. As you know, I was at Swindon Poetry Festival recently and I’m still buzzing about that. I loved the whole festival but my brightest highlight was the chance to read one of my poems to Don Share, Editor of Poetry magazine, Chicago, in a masterclass. It was just fantastic to have Don Share pay attention to my poem. Someone who reads so much poetry – the magazine receives 120,000 submissions a year – is clearly able to offer insightful, helpful, relevant, interesting, imaginative comments about how to improve a piece of writing. Believe me, I paid attention to what he said and I’ve re-shaped my poem in light of his suggestions. That poem is now working its way through a magazine’s submission pile (no prizes for guessing where I’ve sent it!) so I don’t have to think about it again until next year. Straight after Swindon, I started an online poetry course run by Glyn Maxwell and the Live Canon poetry ensemble, a company of actors who perform poetry on stage. I’ve written about them before as I was a runner-up in their open competition last year and saw one of my poems performed by them at the Greenwich Theatre. I’ll write a separate post about the course itself (although I’ve agreed not to divulge much about the course materials, as, understandably, Glyn and Live Canon own the copyright to these and want to develop and market the course further) but I can say that Glyn’s writing exercises are different to ones I’ve ever undertaken before! He’s certainly got me thinking in a whole different way about how to approach a poem. I’ve just received recordings of three of my poems (all part of the course) and it’s been extremely enlightening to hear my words interpreted by actors. Lots and lots of food for thought. Something else that’s keeping me extremely busy is looking after my lovely husband, Andrew! 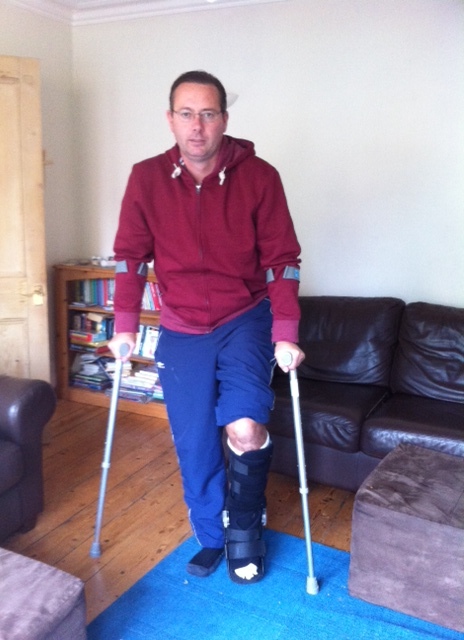 Poor bloke has ruptured his Achilles’ tendon and is going to be on crutches for weeks, even months. Here he is obligingly illustrating the current state of affairs. And, finally……. news of my pamphlet! I’ve been working my way through detailed feedback from my editor at tall-lighthouse, Gareth Lewis, and doing some re-writing of longer-lined poems so that they fit more comfortably within the margins of an A5 book. I should be able to give you news soon about a publication date and book launch. The title is still undecided but I’m nearly there! That’s all of my news for now. 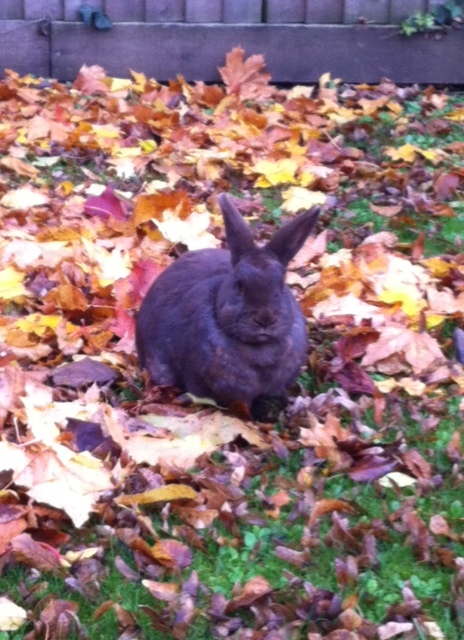 Here’s one of our family’s pet rabbits, Juliette, enjoying a fiesta of leaves in our back garden. Wishing everyone a happy, productive week. Lovely post, though my heart goes out to your poor hubby. The Reader Organisation work sounds wonderful and I can imagine the satisfaction it brings.